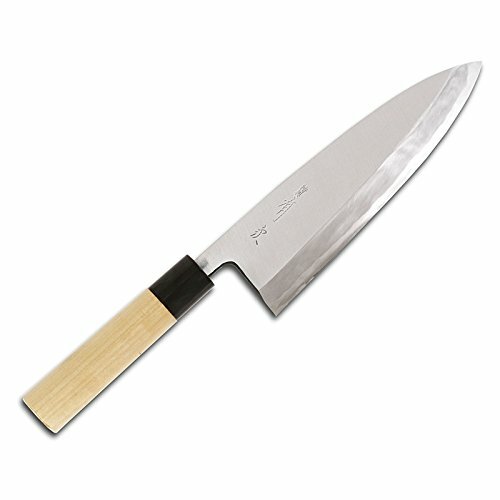 New Aritsugu 19.5 cm./7 3/4"(blade length) hon kasumi ai-deba. The Aritsugu Company is well know in Japan for its more than 400 year history of making high quality swords and knives. Deba knives are used for cutting fish, meat and chicken.This should not be used on frozen foods or for cutting bones. The blade is high quality shiro-ko(white) carbon steel. This is not stainless steel and must be cleaned and dried after use to prevent stains. The handle is Japanese magnolia with a water buffalo horn bolster. Note: The color of the bolster varies. If you have any questions about this product by Aritsugu, contact us by completing and submitting the form below. If you are looking for a specif part number, please include it with your message.